Pitcher plants are well known for their carnivory: they live in soils with low nitrogen content, and they have spectacular adaptations for catching and digesting arthropods as an alternative means of nitrogen acquisition. But in Borneo, there are some pitchers that aren’t so great at catching arthropods. For instance, the Nepenthes lowii pitcher plant produces two kinds of pitchers: when the plants are immature, their pitchers are close to the ground, and they are proficient at catching and digesting arthropods. But when the plants are mature, they produce aerial pitchers with different shapes, open lids, no slippery wax, and rough inner surfaces. In other words, the aerial pitchers are missing many of the important adaptations for trapping arthropods. The aerial pitchers also have specialized nectar glands on the underside of the lid, and a super cute mammal called a tree shrew visits those nectar glands. And get this: the nectar glands are positioned in such a way that the tree shrew sits in the mouth of the pitcher plant while feeding, and that ensures that if the tree shrew defecates, it will fall into the pitcher plant. (You might need a visual of how shrews loo by sitting on the toilet backwards.) Clarke et al. (2009) estimated that 57-100% of the adult pitcher plants’ foliar nitrogen comes from tree shrew poo. Isn’t that wild?! So, are tree shrews the only mammals that use pitchers as toilets? Nope. A different species of pitcher plant in the same genus (Nepenthes rafflesiana elongata) is also quite bad at catching arthropods. That was puzzling until Ulmar Grafe et al. (2011) found Hardwicke’s woolly bats (Kerivoula hardwickii hardwickii) roosting inside the pitcher plants during the day. In fact, the Hardwicke’s woolly bats that Ulmar Grafe et al. (2011) followed during their study roosted exclusively in pitcher plants! And the plants with bat visitors received ~34% of their foliar nitrogen from the bats. So, yeah, this interaction is kind of like paying for your room at a motel by leaving the toilet unflushed. Clarke, CM, U Bauer, CC Lee, AA Tuen, K Rembold, and JA Moran. 2009. Tree shrew lavatories: a novel nitrogen sequestration strategy in a tropical pitcher plant. Biology Letters 5: 632–635. Ulmar Grafe, T, CR Schoner, G Kerth, A Junaidi, and MG Schoner. 2011. A novel resource–service mutualism between bats and pitcher plants. Biology Letters 7: 436–439. 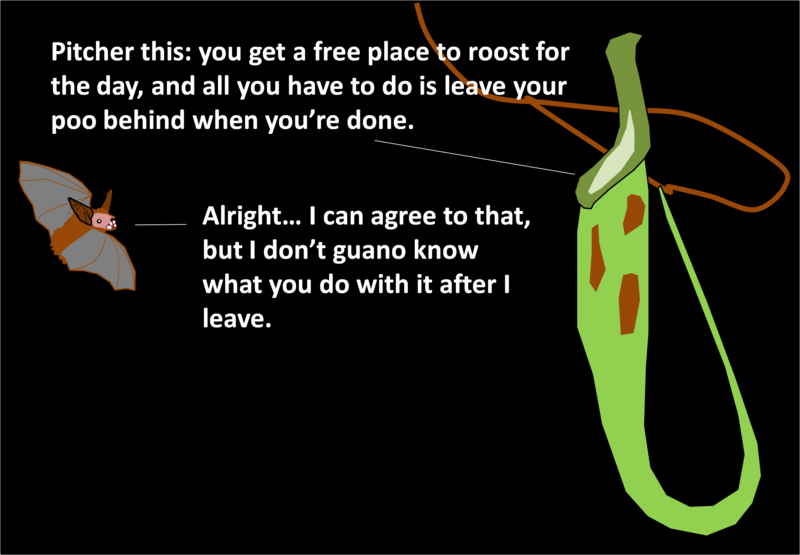 This entry was posted in Cool Literature and tagged bat, mutualism, pitcher plant, tree shew by dinoverm. Bookmark the permalink.